Winnie the Pooh, also known as Pooh Bear, was created by English author A. A. Milne in 1926 based on his son Christopher's favorite teddy bear. Pooh and his friends eventually became one of the most beloved additions to the Disney collection of animated films. 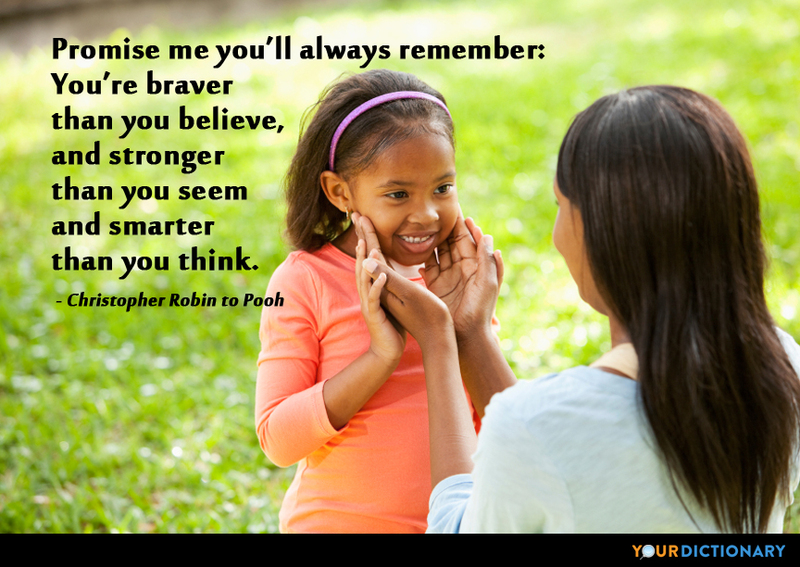 Let YourDictionary help you share your favorite Winnie the Pooh quotations with both the young and the young at heart. Tut tut, looks like rain.  From Winnie-the-Pooh (1926), said by Christopher Robin. These notices had been written by Christopher Robin, who was the only one in the forest who could spell; for Owl, wise though he was in many ways, able to read and write and spell his own name WOL, yet somehow went all to pieces over delicate words like MEASLES and BUTTERED TOAST.  Winnie-the-Pooh (1926), Chapter Four. "Because my spelling is Wobbly. It's good spelling but it Wobbles, and the letters get in the wrong places."  Winnie-the-Pooh (1926), Chapter Six, said by Pooh. Owl was telling Kanga an Interesting Anecdote full of long words like Encyclopædia and Rhododendron to which Kanga wasn't listening.  Winnie-the-Pooh (1926), Chapter Eight. "It's a little Anxious," he said to himself, "to be a Very Small Animal Entirely Surrounded by Water."  Winnie the Pooh (1926), Chapter Nine, said by Piglet. We can't all and some of us don't. That's all there is to it.  Winnie-the-Pooh (1926), said by Eeyore. The more he looked inside the more Piglet wasn't there.  Winnie the Pooh (1926), Chapter One. "Nearly eleven o'clock," said Pooh happily. "You're just in time for a little smackerel of something."  The House at Pooh Corner (1928), Chapter One. "I've got a sort of idea," said Pooh at last, "but I don't suppose it's a very good one." "I don't suppose it is either," said Eeyore.  House at Pooh Corner (1928), Chapter Six.  From Winnie-the-Pooh (1926), said by Pooh. It is hard to be brave, when you're only a Very Small Animal.  From Winnie-the-Pooh (1926), said by Piglet. Piglet was so excited about the idea of being Useful that he forgot to be frightened any more. It's so much more friendly with two. You can never tell with bees. It sounded to him like a riddle, and he was never much good at riddles, being a Bear of Very Little Brain. It's not much of a tail, but I'm sort of attached to it.  From The Many Adventures of Winnie the Pooh (movie, 1977).  From The House at Pooh Corner (1928), said by Piglet. "In fact," said Rabbit, "Tigger's getting so Bouncy nowadays that it's time we taught him a lesson. Don't you think so Piglet?"  From The House at Pooh Corner (1928). "Pooh, promise you won't forget about me, ever. Not even when I'm a hundred." Pooh thought for a while. "How old shall I be then?" "Ninetynine." Pooh nodded. "I promise," he said.  From The House at Pooh Corner (1928), said by Christopher Robin. For a long time they looked at the river beneath them, saying nothing, and the river said nothing too, for it felt very quiet and peaceful on this summer afternoon. But it's always useful to know where a friend and relation is, whether you want him or whether you don't.  From The House at Pooh Corner (1928), said by Rabbit. Pooh knew what he meant, but, being a Bear of Very Little Brain, couldn't think of the words.  The House at Pooh Corner (1928).  The Many Adventures of Winnie the Pooh (movie, 1977). "Good morning, Eeyore," said Pooh. "Good morning, Pooh Bear," said Eeyore gloomily. "If it is a good morning," he said. A bear, however hard he tries, grows tubby without exercise. Promise me you’ll never forget me because if I thought you would I’d never leave. Friendship is a common theme in the most popular Winnie the Pooh quotes. Since stories often center around Pooh Bear's relationship with Eeyore, Piglet, Tigger, and Rabbit, there are many sayings from the stories reflecting on what it means to be a true friend. Throughout all his adventures, Pooh Bear knows that he'll be OK as long as he has a friend to count on. "Good friends will help until you're unstuck," Milne wrote. Pooh Bear is often described as a bear of "Very Little Brain" throughout Milne's stories. He's not the smartest of the group, but he has the biggest heart. "Pooh knew what he meant, but, being a Bear of Very Little Brain, couldn't think of the words," Milne wrote. Winnie the Pooh stories often seek to teach children character lessons, so you'll find a number of quotes discussing concepts such as patience, dedication, honesty, and trustworthiness. Pooh Bear admires people who do the right thing, even when it's difficult. He also empathizes with those who struggle to be brave, which is a message children can appreciate. "It is hard to be brave when you're only a Very Small Animal," Milne wrote.